Tucson is a relatively stable space for retailers. It’s seen growth booms and busts, not unlike Phoenix. But unlike Phoenix, its bubble didn’t swell so high and fast. It never got a crosstown freeway, so interstate frontage was largely reserved for industrial uses and homes and shopping were built in the city’s core. Shopping centers were never overbuilt. And it’s even closer to Mexico, home to many a weekend shopper. So malls, those enclosed, tiled, air-conditioned and pretzel-scented bazaars, have better results than the industry stories usually tell, even with newer mall-like complexes like power centers and lifestyle centers within a few miles. The areas around Tucson’s two large traditional malls, Tucson Mall and Park Place, remain very attractive to restaurants and shops. They’re “hubs,” said Nancy McClure, First Vice President and a retail specialist at CBRE’s Tucson office— so much so that developers are razing older, dated shopping centers in their immediate area to put up new big boxes (see accompanying story). Because retailers never built a glut of stores, shopping real estate has always been at a premium. Typically, a retailer will go to Phoenix first, get excited about the four million-plus person market and put up 15 stores, then do two or three in Tucson just to see how it goes, then move on to another market. Because the Tucson market doesn’t get as diluted, it tends to do well. Pat Darcy, retail division head at Tucson Realty & Trust, said because Tucson doesn’t have nearly as many major corners as Phoenix does, it makes sense to be by one of the malls. Darcy said the Tucson and Park Place malls are spaced out enough that they don’t really compete with each other. At Park Place especially, on Tucson’s golden retail road of Broadway Boulevard, it can be hard to find a parking spot, he said. In the Phoenix area, Mesa laments the continued fading of Fiesta Mall, which earlier this year took a blow when Macy’s announced it was closing its anchor there as part of a nationwide cost-cutting effort. In December, the Washington Post waxed nostalgic about the last Christmas season of the once-upscale White Flint Mall in Bethesda, Md. The Scranton (Pa.) Times-Tribune traced the rise and fall of the city’s Mall at Steamtown, a “great idea at the time” when it was conceived in 1985 and opened in 1993. America’s first mall, the Southdale Center in Edina, Minn., lives on in suburban Minneapolis, but after “de-malling” with additional outside entrances that allow shoppers to avoid the central common areas that define the traditional mall. In its 2013 report “Brick by Brick: The State of the Shopping Center,” consumer research group Nielsen says at the regional level, upscale lifestyles are replacing traditional enclosed malls and they tend to be concentrated in urban areas, with larger regional centers in suburban and rural areas. A malls draws from a 15-mile or greater radius, and shoppers who have invested the travel will make the most out of other shopping nearby, like the nearest grocery store or complementary specialty store. That’s why you see the same neighbors within any mall’s orbit, like David’s Bridal, Toys R Us, or Best Buy. Furrier said he tells clients to pull out all the ads from the Sunday newspaper and see where the stores are located— nine out of 10 will be near a mall, he said. Malls, he said, create energy. By the traditional definition of mall as a large enclosed shopping space, multi-winged and sometimes multi-story, with a handful of national department store anchors and smaller national retailers and a food court in between, Tucson has two malls: Tucson Mall at Oracle and Wetmore roads, Park Place on Broadway between Wilmot and Craycroft roads. There’s also Foothills Mall at Ina Road and La Cholla Boulevard, which has an emphasis on outlet stores. That’s the old-school. For the new school, there are power centers and lifestyle centers, which are open-air and inside-out versions of traditional malls. Power centers have a variety of big-box anchors and smaller national or local suites that may be joined like a shopping strip, but they do not have the enclosed corridors, courtyards or clustered food courts. Shoppers park in front of their anchor of choice. Lifestyle centers tend to be more upmarket. Their stores may face courtyards, or “main street” walkways. traditional mall that was reborn as a power center in a relatively compact space at Broadway near Alvernon Way, and La Encantada, a chic lifestyle center at Campbell Avenue and Skyline Drive. Brighid Brown, marketing manager, for General Growth Properties-owned Park Place and Tucson Mall, said Tucson has a loyal shopper base and she is optimistic that growth will continue. In the near future, that means a new Yard House restaurant, a Sephora store and a buildout of the Victoria’s Secret for Park Place, and some new tenants for Tucson mall who she could not yet disclose. Melanie Sutton, senior marketing manager at La Encantada, said shoppers like the non-cloistered feeling of the center’s courtyard, where they are welcomed to bring leashed dogs. The center boasts tony retailers like Tiffany & Co. and Coach, an AJ’s Fine Foods, Crate & Barrel, and a popular Apple store, among other tenants. The 10-year-old center has always maintained above 90 percent occupancy, she said. She also credits Mexican nationals as a core customer base. La Encantada, like Park Place and Tucson Mall, also visits Mexico to get the word out. “We go down to Hermosillo to Ciudad Obregon San Carlos and we do trade shows down there,” she said. McClure said the Mexican shoppers have been crucial. They’re typically very loyal with product lines and where they like to stop, and they will make shopping circuits where they spend a lot of money, often cash. “I think what really got us through the recession, unlike a lot of other communities of our size, was that we really do attract the affluent Mexican shoppers,” she said. McClure said having both of Tucson’s main malls has made the Chicago-based GGP good at reading the market and keeping shoppers compelled to visit both sites, which are roughly 20 minutes of drive-time apart, by offering differing product lines. “So like, Park Place mall has a movie theater. Tucson Mall doesn’t. I can say by experience, if you have a teenager, Park Place mall has an Abercrombie & Fitch, and Tucson Mall has a Hollister,” she said. Darcy said all retailers, malls included, need to update to stay relevant, and the local malls have done so. 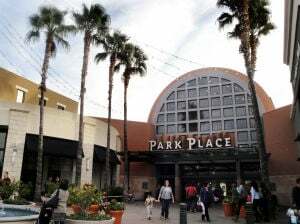 Park Place was expanded and updated from 1999 to 2003, and Tucson Mall got its streetscape in 2010. During the recession, McClure said temporary tenants took up spaces in the malls just to keep them occupied, but she’s now seeing less of those short-term tenants and the return of national retailers. Although it’s not seen so much in the Tucson market, some malls elsewhere are trying to keep things fresh by offering experiential opportunities, such as more bars and restaurants, entertainment and physical activities like rock climbing walls and wind tunnels to simulate skydiving. For the traditional malls, streetscape retailers are also an adaptation. Those are visible in Tucson — these are the high-visibility stores and restaurants that face the street and don’t connect to the interior of the mall at all, such as the Old Navy at Park Place and the REI at Tucson Mall. As Park Place grew in popularity after it revitalized, the former El Con Mall, which opened in the 1960s, dwindled. The trade area around El Con is diverse, with a range of incomes and demographics, a convenient and highly traveled midtown location and its proximity to the University of Arizona. But it was in the shadow of Park Place only about two and a half miles away. McClure, who was part of the center’s rebirth efforts, said there were lots of things still right about El Con. So in 2011 it was torn down to become a power center, with high-profile pads on the street and major retailers like Walmart, Target, Petsmart and JCPenney. The center currently offers close to 900,000 square feet of shopping space. PICOR’s Furrier said Broadway is the best street in the city, not just for retail but for office. With office workers concentrated along Broadway, Park Place is an attractive place to grab lunch or other provisions regardless of where those workers live. Furrier said his own teenagers go to the mall with friends, although they don’t hang out all day like teens of decades passed. Still, he doesn’t see the local traditional malls suffering much stress in the near future— they bring in sales of more than $400 per square foot, he said. Contact reporter Hillary Davis at [email protected] or (520) 295-4254.